The new BMW Sauber has been developed in two phases. A first one that started very early was a project of evaluating different solutions for pretty much everything about the car. Then, after choosing the better solution, the component is developed and fitted onto the car for evaluation. The nose section of the new F1.09 underwent the same development procedure in which the team found that the wide nose worked best with the new front wing. Obviously BMW have done their homework rather well, as several other teams - such as the likes of Renault and Williams - have come to similar conclusions. 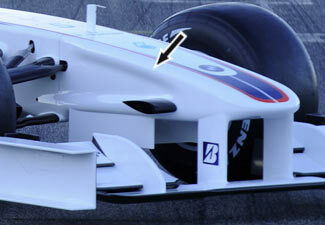 BMW is however the only team that has bumps on either side, attempting to have more air between the front wheels. Ideally, the nose would be just the upper and lower surface, but that is obviously not possible and not allowed either.